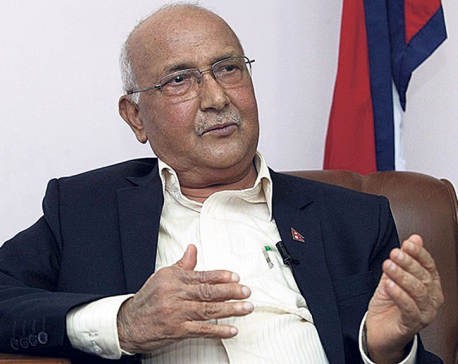 KATHMANDU, June 2: With the inclusion of the Federal Socialist Forum Nepal (FSFN) into the cabinet on Friday, the KP Sharma Oli government now commands a two-thirds majority in parliament. This arithmetic allows the government to take any decision, including amending the constitution. In the fourth extension of the cabinet on Friday, Prime Minister Oli inducted FSFN Chairman Upendra Yadav as deputy prime minister and minister for health and Mohammad Istiyak Rai as minister for urban development. 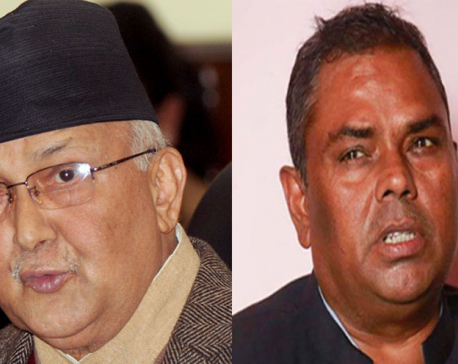 The prime minister also promoted Minister for Defense Ishwar Pokharel to deputy prime minister, and State Minister for Communications and Information Technology Gokul Banskota becomes full minister in the reshuffle effected to accommodate the FSFN, a major Madhes-centric party. Sources said Prime Minister Oli was forced to break his earlier decision not to have any deputy prime minister in his cabinet after FSFN Chairman Yadav insisted on the post of deputy prime minister along with the health ministry portfolio. The prime minister has given Deputy Prime Ministers duo Pokharel and Yadav first and second places in the cabinet hierarchy respectively. FSFN decided to join the Oli government after reaching a two-point agreement with the ruling Nepal Communist Party (NCP) last week. The agreement, among other things, promises to bring amendments to the constitution to address the grievances of Madhesi people. Leaders said the ruling NCP has agreed to give two full ministers and one state minister to FSFN in the federal cabinet. 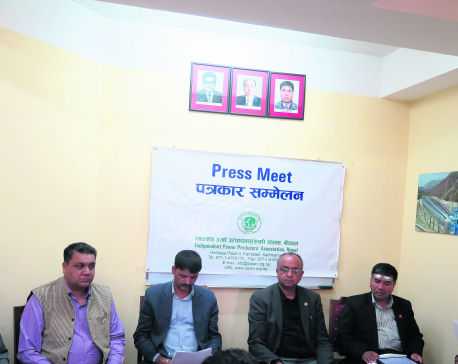 Although Padma Aryal is currently state minister for health, officials said the portfolio will be given to FSFN and Aryal transferred to another ministry . "State Minister Aryal will remain in the same position for now," said the prime minister's press advisor, Kundan Aryal. The NCP, which was formed after the unification of the erstwhile CPN-UML and CPN (Maoist Center), has a total of 174 members in the 275-member House of Representatives. Altogether 16 legislators have been added to the ruling combination after the inclusion of FSFN in the cabinet. With the latest expansion of the cabinet, the number of ministers in the Oli governemnt has reached 24, including two deputy prime ministers and three state ministers. Existing constitutional provisions bar the government from forming a cabinet that exceeds 25 members including the prime minister himself and state ministers. Inclusion of one state minister from FSFN will give full shape to the cabinet. The decision of the FSFN to join the Oli government has unsettled the alliance between FSFN and Rastriya Janata Party Nepal (RJPN). The two Madhes-centric parties have formed the provincial government in Province 2. Senior RJPN leaders allege that Prime Minister Oli had deliberately avoided them in parliament even though they had expressed readiness to be part of the government should the ruling CPN express commitment to amending the constitution. “This is an attempt to oust us from the provincial government. FSFN has decided to be part of the Oli-government, giving up the entire agenda of Madhes,” said a senior RJPN leader asking not to be named. The provincial assembly in Province 2 has a total of 107 members. While NCP has 32 members in the assembly, FSFN has 30. Similarly, RJPN and NC have 25 and 19 members respectively. Independent candidate Rizwan Ansari was also elected during the recent election. 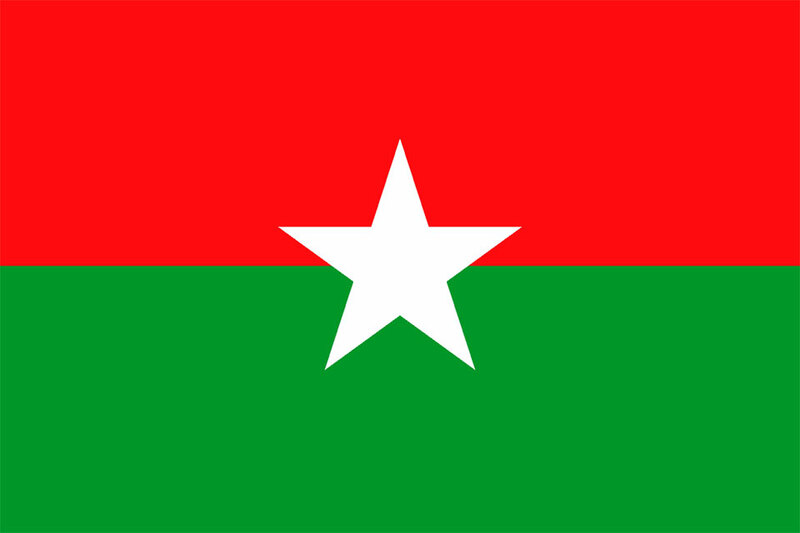 A section of RJPN leaders fear that the NCP and FSFN may form a new government in the province in due course.